In a medium bowl, combine the chicken, apple, onion, grapes, and salt. Set aside. In a small bowl combine peanut butter, mayonnaise, and honey and stir well. Pour sauce over chicken mixture and toss to coat. At this point you can refrigerate the filling until ready to serve. Spoon filling into a crisp lettuce leaf and roll up. Serve. Have you gone nuts searching for the perfect lettuce wrap? Let the search be over. With just a little twist on the classic chicken wrap, your family will be going nutty over these Healthy Chicken and Peanut Butter Lettuce Wraps. You see…I have a bit of a peanut butter obsession. It’s easy enough to squeeze peanut butter into a dessert but finding a way to incorporate it into breakfast, lunch, and dinner takes real talent. Peanut butter tends to get a bad rap for being loaded with fat and calories. But the key to eating healthy is moderation -- just eat a little of whatever you love. 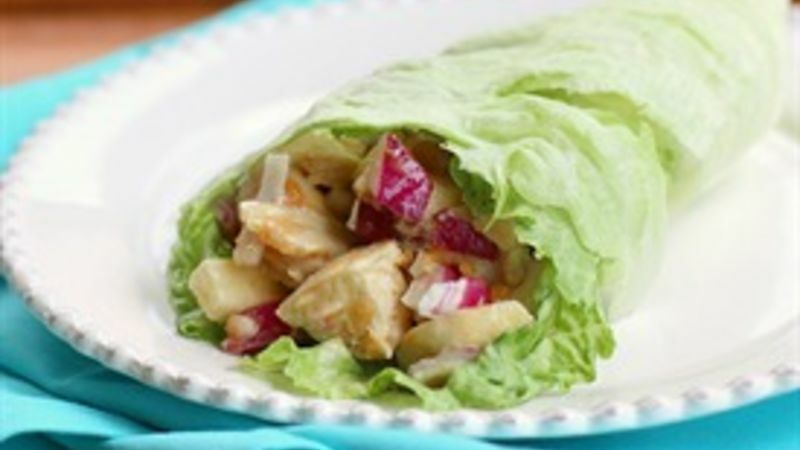 These healthy wraps are full of chicken, apples, grapes, and onions and are tossed with a light honey and peanut butter sauce made with natural peanut butter. It’s the perfect amount of peanut butter to give the wraps the nutty flavor I crave without overwhelming the dish with too much peanut butter flavour. Natural peanut butter has a runnier consistency than regular peanut butter, so it works great for making a sauce with a good consistency to toss the chicken filling. But if you don’t have natural peanut butter on hand, don’t make a special run to the store; just melt regular peanut butter in the microwave for 10-20 seconds to get it to a consistency thin enough to incorporate into the filling. If You Like PB then you’ll love these recipes!